The flagship tournament festival at partypoker, POWERFEST, returns on March 31 and runs through April 14, during which time $30 million is guaranteed to be won. Fifteen days of intense poker tournament action is scheduled in the latest edition of POWERFEST, with more than 250 individual tournaments planned. All POWERFEST events are no-limit hold’em although there are a wide rage of different formats including six-max, eight-max and mix-max plus progressive knockout, turbo, hyper-turbo, deepstack and slow structures to choose from. Like in previous incarnations of POWERFEST, events are split into low, mid, high and super high rollers with buy-ins starting at only $5.50 and going all the way up to a $25,500 Super High Roller event that has $2.5 million guaranteed. Each day of POWERFEST sees at least eight events scheduled between 5:30 p.m. and 10:00 p.m. CET. Sundays are by far the busiest POWERFEST days, as you would expect, with the opening weekend featuring 25 events with guaranteed prize pools weighing in at more than $3.7 million. 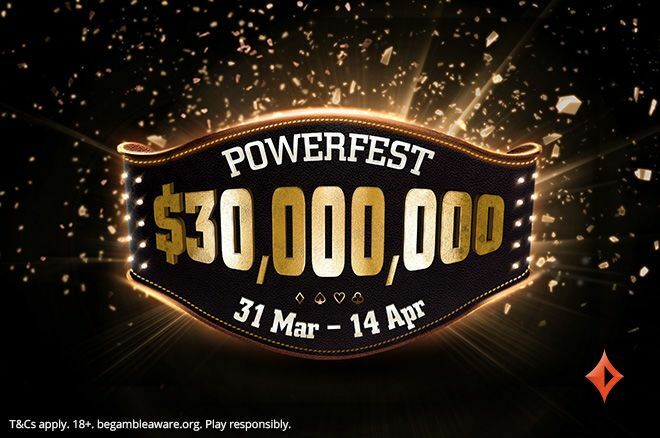 Five Championship Events, each with at least $1 million guaranteed, take place during this $30 million guaranteed POWERFEST. The first kicks off at 6:00 p.m. CET on April 4 and is a $10,300 buy-in affair. This is followed seven days later on April 11 by a $25,500 Super High Roller that is sure to grab the attention of the poker community. “WWWpartyCOM” won the last $25,500 buy-in POWERFEST event at partypoker. That tournament in May 2018 saw 202 players buy in and $5,050,000 shared among the top 32 finishers. It ended in a three-way deal that saw the champion bank $872,839. New POWERFEST related SPINS jackpot sit & go games have been launched in time for the $30 million guaranteed festival. The $5 buy-in level awards cash prizes of between $10 and $20 or POWERFEST tickets valued at $33 up to $530. A larger $50 buy-in edition is also available that pays cash prizes of $100 and $200 or POWERFEST tickets from $530 up to $25,500. Up it to at least $20 for $30 worth of SPINS tickets awarded over the space of six days.